When a couple of friends from abroad came down to Chennai, we decided to crash at a hotel and have a nice evening catching up with all the stories. Raintree in Teynampet was touted to be number one according to Trip Advisor and it wasn’t that expensive either. So I checked for prices online and found a deal in Make my trip where I get to reserve a room for a certain price and can pay it in person at the reception. We had to get two rooms and we booked them online. The price per room was Rs. 6250 including breakfast. Though I found the reception desk to be not managed at a level I expected, the staffs were friendly and courteous. After the general ID checks, we were given cards that gives us access to the lifts and our rooms. Room as such was very clean and simple. Even though it didn’t give us that ‘wow’ feel, the decor and lighting made the room look very subtle and serene. Once we enter, the bathroom is at the left and cupboards with safety locker and ironing board is on the right. The usual looking bed is guarded by two nice bedside cabinets which has the power switches and sockets above it. At the far end is the glass wall with a view of the ever busy Anna Salai and the slum nearby. The curtains are thick enough and does a great job of keeping sunlight at bay. Next to it is a glass top study table with an ergonomically shaped cream coloured chair that blends well with the wall paint color and lighting. The same colour is also incorporated in the recliner chair with leg rest which is super comfy. Bedding was very comfortable and clean. Loved the perfectly thick duvets. In room temperature control worked perfectly. TV was a bit of a let down. It’s remote is old fashioned and it stopped working half way through a program. Though the staffs rectified it, it did take a while and I feel it’s something that shouldn’t have happened at the first place. Bathroom wasn’t spacious but had all amenities required. The hair dryer wasn’t working properly and it had to be plugged in and out a couple of times for it to work. One thing guests look forward to is a neat and clean bathroom and it’s no complaints in that section as far as Raintree is concerned. The mini fridge was pretty well stocked up and the tea collection comes handy. With a kettle and free bottled water, making teas were never so easy. 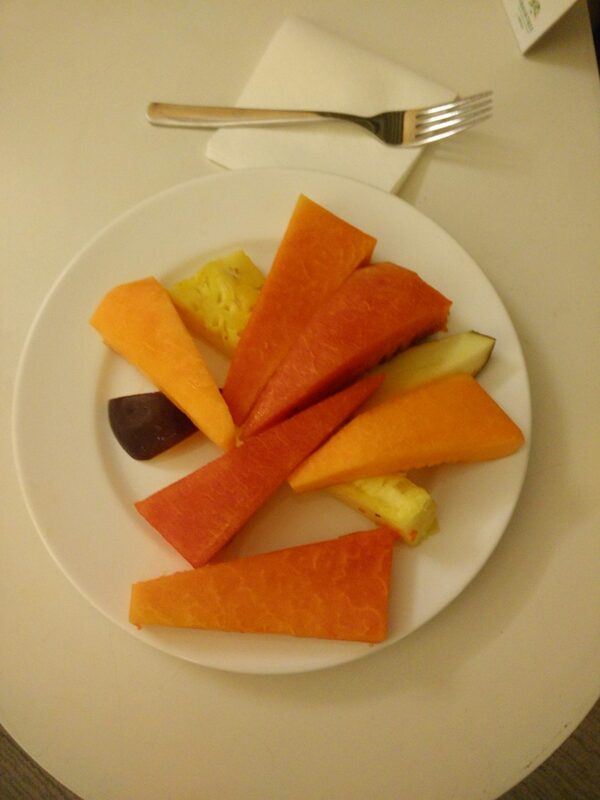 They also gave complimentary fresh cut fruits which included melons, papaya and pineapple. They made an awesome late night snack. Service was excellent. Right from technical staffs who made our TV work again to the regular housekeeping members, all were courteous and helpful. Hangover took the best of my friends and I didn’t want to dine alone for breakfast, so decided to give it a skip. But from my previous experience at their restaurant, The Kitchen, I know that it would’ve been a good meal. Checking out was a piece of cake and we had no problem anywhere. I had a really great time at The Raintree and now I know why it’s rated number one in Chennai.